Between the 18th and 26th October we were exhibiting our VR experience as part of the Manchester Science Festival, one of the biggest science festivals in the UK. 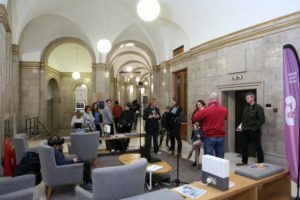 We were situated in the magnificent Central Library between the music library, 7000 feet and an exhibition of images from Manchester’s rock history. The main experience we were showing the public was a virtual reality reconstruction of St Cecilia’s Hall, Edinburgh, in the years 2018 and 1769. Prior to putting the headset on, participants were explained the cultural heritage and significance of the hall, giving them a deeper understanding of the purpose of our research. During our time in Manchester we had well over 250 people experience the VR reconstruction. The majority of people had never user VR previously and were intrigued to learn more. Before the headset was placed on each participant, they were asked to familiarise themselves with the environment and in particular listen to the music. Once comfortable, the virtual scene was changed from St Cecilia’s Hall in its current state to how it is believed it would have looked in 1769. Clearly, looking at these results, it wasn’t just us that were enjoying ourselves at the Science Festival! The responses show an overwhelming desire to see more virtual reality reconstruction of heritage sites, experiencing music of the past as it was intended to be heard and it gave them a heightened appreciation of the venues. Our experience at the Manchester Science Festival was an unbelievable success! Everyone seemed to enjoy hearing about our research, the venues we are looking at, the music we have chosen, how it was recorded and how it was presented – and we enjoyed sharing it with everyone who attended!